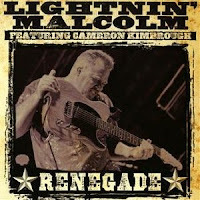 Lightnin’ Malcolm, recently signed to Ruf Records, released his new album Renegade last month. Renegade consists of 13 originals played in the north Mississippi hill country tradition. Our friend Dex of Dex and Zenith’s Blues Bus recently got a chance to speak with him. Click the play button below to hear some tracks from Renegade and the interview. Special thanks to Dex for providing the interview. You can hear more interviews with Dex and Zenith at thebluesbus.com and make sure to follow them on Facebook.